In December 2013, when sectarian and inter-communal violence erupted in and around Bangui, the International Organization for Migration (IOM) arrived in the Central African Republic to support humanitarian operations. Thousands of civilians were killed, and hundreds of thousands were displaced internally or fled the country. The UN estimates that 2.5 million people – out of a population of about 4 million – were initially in need of humanitarian aid. In response to migration issues arising from the crisis, IOM established an office in CAR in January 2014. IOM now operates from a head office in Bangui and two sub-offices, one in Boda (en ethnically mixed community 200 km west of Bangui) and the other in Kabo wich covers also Moyen Sido in northern CAR, close to the border with Chad. IOM’s migration assistance in CAR centres on camp coordination and camp management, displacement tracking, shelter construction for IDPs and returnees, and return assistance to stranded foreign nationals and other vulnerable groups. In an effort to prevent further internal and external displacement, IOM promotes community stabilisation and social cohesion. For example, IOM implements a ‘cash-for-work’ project aiming to benefit a total of up to 10.000 beneficiaries by engaging them in paid daily labour for a period of 10 days each. While in this first phase, disadvantaged community members are able to earn cash to support their families and small business investments, IOM plans to expand the geographical coverage and scope of the project during 2015 and beyond. 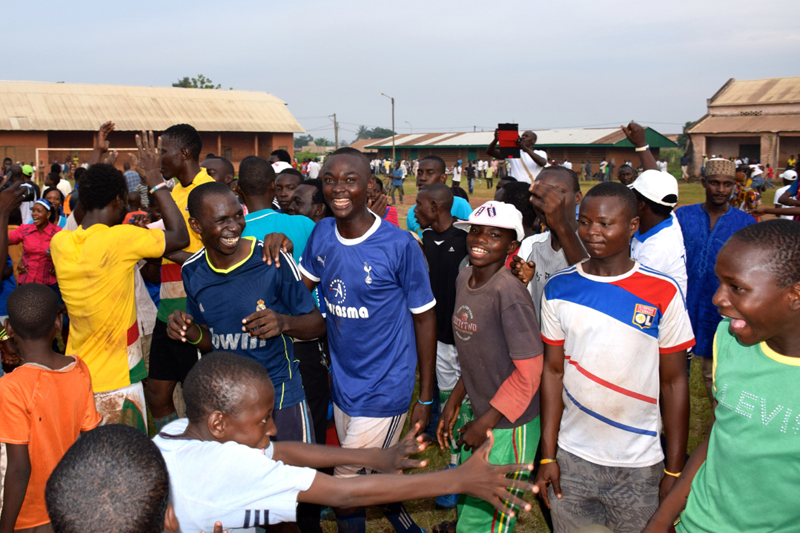 IOM also implemented social cohesion activities in the 3rd and 5th districts to retain the presence of mixed communities in Bangui. Our work in CAR is not finished and in the next few months IOM aims to support the return process of displaced people in Bangui, reinforce its presence near CAR’s borders to effectively assist the displaced population, further expand community stabilisation activities, and explore other traditional areas of IOM’s work such as integrated border and migration management, migration and development, return of qualified nationals, out of country voting, law enforcement and rule of law. The ongoing crisis has had extensive humanitarian, economic, political and security implications for CAR and the neighbouring countries, including Cameroon, Chad, Congo, DRC, Sudan and South Sudan. The crisis has caused large population movements inside the country and across its borders. IOM remains committed to supporting the efforts of the Transitional Government and the international community in the Central African Republic to fully respond to the crisis. Through the Displacement Tracking Matrix (DTM) - a tool developed by IOM to account for the situation and needs of displaced populations in many countries across the world - site facilitators collect information in a consistent, regular and methodic way allowing capturing trends and analyzing information through time. As part of the DTM methodology, IOM profiles on a bi-monthly basis the po pulation displaced across sites in Bangui, gathering not only demographic information, but also information on the living conditions during displacement and the return or relocation intentions. During November 2014, IOM conducted household interviews among 309 IDP households at 29 out of 37 IDP sites in Bangui. The sample has been calculated based on the overall population residing on collective IDP sites with a margin of error of 5.5% and a level of confidence of 95%. IOM designed a graphic novel based on real-life stories of the beneficiaries of its community stabilization project, which aims to promote social cohesion among mixed communities in Bangui. The graphic novel describes, from beneficiaries’ perspectives, the effects of IOM’s cash-for-work activities and efforts to encourage peaceful cohabitation in Bangui communities. The content of the novel was drawn from beneficiaries’ stories of how they found out about the project, why they wanted to participate in cash-for-work activities, and how they used the money they earned to start new lives for themselves and their families. While participating in cash-for-work activities, such as cleaning gutters or repairing bridges, many beneficiaries like to sing songs about their work. This inspired local singer/songwriter Yves to compose an anthem specifically about IOM’s community stabilization project. The French-language song, which plays over the comic book, is being recorded in several local languages including Sango and Arabic. ‘Travaillons en unité pour la cohésion sociale à Miskine” is a community theatre production written by members of the Association Nationale des Artistes Comediens in coordination with the IOM Community Stabilization Unit. The play highlights themes of peace and reconciliation, and promotes peaceful cohabitation in the mixed fifth district in Bangui. The play was performed by two comedians and a woman from the fifth district on August 13, 2014 in Bangui. IOM’s Community Stabilization Unit is supported by the European Union.